Field Link allows you to modify the most commonly used settings in your Castle controller all at the touch of a single button. Simply connect the Field Link to the throttle lead of the controller to power up. Click the button to scroll through and change the indicated settings. That easy! 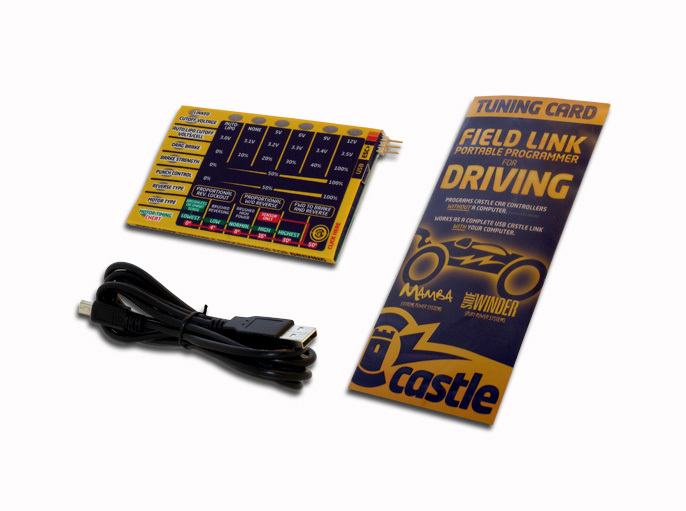 This programming card also works as a standard Castle Link that gives you access to the entire world of Castle tuning functionality via supplied USB cable. Requires USB 2.0 on a Windows PC running Castle Link software. The card is programmed to work with all Castle Link compatible car controllers running software released since 2007 including: Mamba Monster(all versions), Sidewinder 1/10th, Sidewinder Micro, Mamba 25, Mamba Micro Pro, Mamba Max Pro, Mamba Max(You must upgrade the Mamba Max to software version 1.23 or higher with your Windows PC to enable throttle cable USB connectivity). System Requirements: Castle Link is compatible with Windows 2000, XP, Vista and Windows 7. *Windows 7 and Vista require a specific installation process. 1. Download the software to your computer. 2. Right click on the downloaded file and left click "Run as Administrator". 3. Run the software clicking through any and all warning messages and the link will be installed.